Did you ever wonder what was lurking under your bed as a child? Were you convinced there were monsters under there that only you could see and hear? 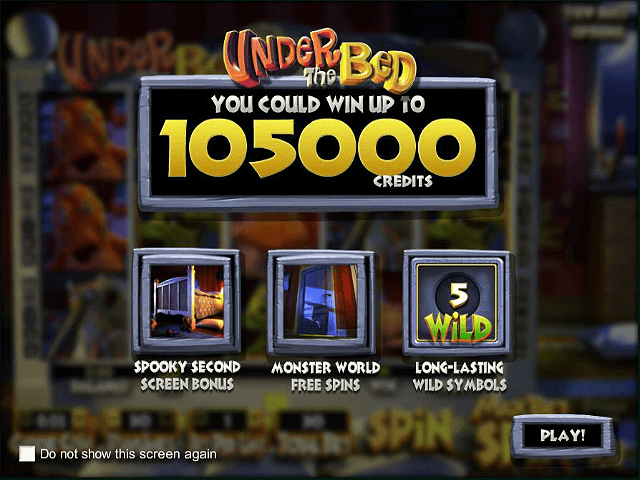 If so then this beautifully presented five-reel, 30-payline slot from Betsoft may well reawaken that sense of wonder – and perhaps even give you a few sleepless nights, too. 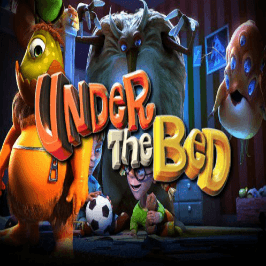 If the developers over at Betsoft say they weren’t inspired by Pixar’s hit 2001 movie Monsters, Inc when they came up with Under the Bed then take it with a pinch of salt. Thankfully, this can be considered a good thing as there’s little doubt they took the idea and ran with it successfully. Essentially, the story revolves around two small children, Jesse and Jane, who are scared to go to sleep because they’re convinced the monsters under their bed are bad. Your job, such as it is, is to put their minds at rest and get them off to sleep. Visually, the game looks amazing, with the action taking place in a dimly lit children’s bedroom rendered in top-notch 3D graphics. The two nicely animated children stand tentatively to the right of the reels (set on the end of their bed), hand-in-hand, evoking a sense of childlike wonder that Spielberg would be proud of. The audio accompaniment is highly effective too, with a playful soundtrack and a range of humorous and sometimes scary sound effects dropped in at suitable moments. 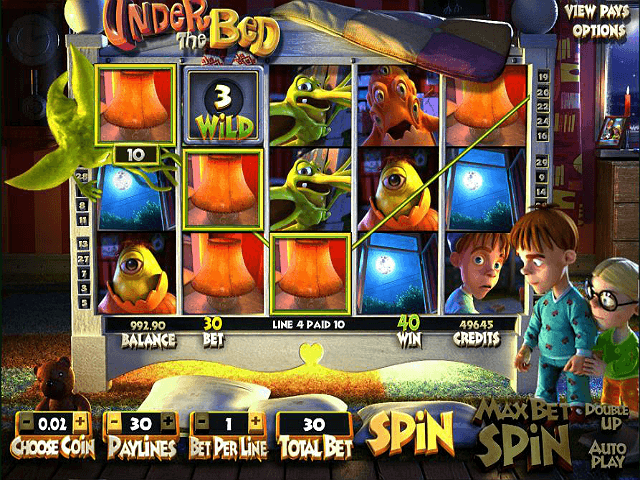 You can play the Under The Bed slot game from as little as £0.02 to as much as £150 per spin. The theoretical Return-to-Player (RTP) value is advertised as 96.40%. 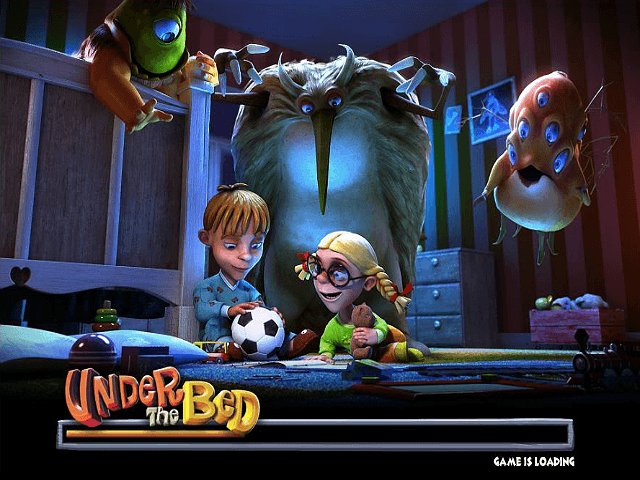 The symbols in Under the Bed are relevant to the story and include, along with Jesse and Jane, four different monsters, an orange lamp, an open window and their parents’ legs. Many of these become animated when they form a winning combination. The wild symbol is a green ‘Wild’ which only pops up as part of a feature. There are also two bonus symbols: a bed and a door. If the door symbol appears in the centre of the third reel then you’ll get 12 free spins. Land three or more bed symbols anywhere on the reels however and you’ll get taken to a new screen showing the kids on their bed. This is effectively a ‘pick me’ game so all you have to do is make a selection from the cards at the bottom of the screen to win a prize. This feature ends when you choose a card with the children’s parents on. You should be aware that some of the symbols are gold-rimmed when they land on the reels. Make a winning combination with one of these bad boys and you’ll trigger the Sticky Wild feature, another bonus round where one of the symbols will flip over to reveal a locked wild and the number (up to five) of spins it will remain in place for. Betsoft has clearly put plenty of time and effort into the development of this game. Without doubt, the stunning graphics and fun gameplay make it an easy slot to get stuck into, while the bonus features do a grand job of maintaining your interest. The propensity to accumulate plenty of (modest) wins during sessions is the cherry on the cake. 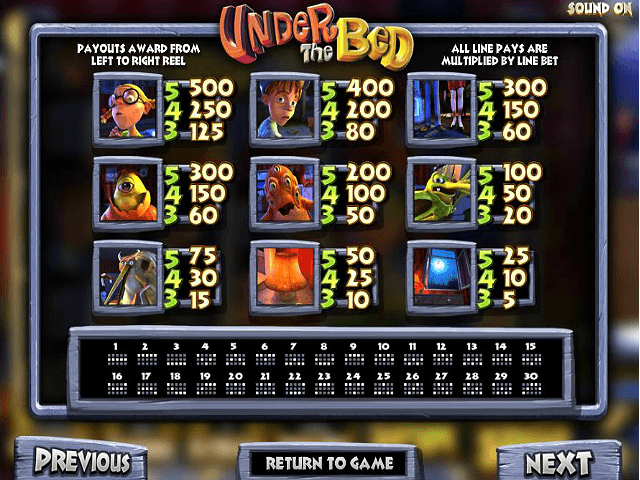 If you like Under the Bed - You'll like these slots too!